Laos, 1979: Dr. Siri Paiboun, the twice retired ex-National Coroner of Laos, receives an unmarked package in the mail. Inside is a handwoven pha sin, a colorful traditional skirt worn in northern Laos. A lovely present, but who sent it to him, and why? And, more importantly, why is there a severed human finger stitched into the sin's lining? Siri is convinced someone is trying to send him a message and won't let the matter rest until he's figured it out. He finagles a trip up north to the province where the sin was made, not realizing he is embarking on a deadly scavenger hunt. Meanwhile, the northern Lao border is about to erupt into violence—and Dr. Siri and his entourage are walking right into the heart of the conflict. Please keep Dr. Siri alive! What made the experience of listening to Six and a Half Deadly Sins the most enjoyable? but it's better than no Dr. Siri, so I am glad to have it. I couldn't get into his other series at all. I love the history of Laos and the characters in this series. I love these books which are staged in 1970s Laos and present history and culture as the fundamental context of the story. The characters are strong and memorable. I truly hope author Cotterill keeps writing this particular series. Dr Siri is still retired from being coroner, but not from being an obsessed detective. The first clue is a beautiful garment known as a sin which arrived in the mail, and had a preserved finger sewn into the hem. So, of course, he needed to make some interesting arrangements in order for he and Mme Daeng to follow the clues. The initial clue and half the sin were left with nurse Dtui for further study, and off they went, and were surprised along the way to encounter Mr Civilie. The major parallel plot is of Inspector Phosy who had been sent to the North to investigate a problem, and all aspects were decidedly impacted by the withdrawal of the Chinese from Laos as the Chinese invaded Vietnam. No spoilers here, just go ahead and get drawn into the book! Clive Chafer continues to be excellent as narrator! Dr. Siri books are not the type I usually enjoy--too much other-world spirit activity. The characters and the stories are entertaining and teach a little history of Laos. The narration is fantastic. I listen while I do chores, and I count on listening as bedtime stories. Clive Chafer's voices are distinct but not exaggerated. They are a dry emotionalism that perfectly balances the wild plots. I have all but one of the Dr. Siri books and highly recommend as entertainment. Not sure how I feel about that ending! Hmmmm I hope there are more of these. I like these guys. The best part is that I have learned much of the history and politics of the Vietnam war that many of us kids of the seventies had no real awareness of. Clive's voice is a little nasally but he pulls it off. I look forward to each new book with joy. The stories are complex, the characters well developed & the narrator smoothly sonorous! What's next? because I learned about part of the world I had limited knowledge about. What adds to this book and the series is the great narrator. 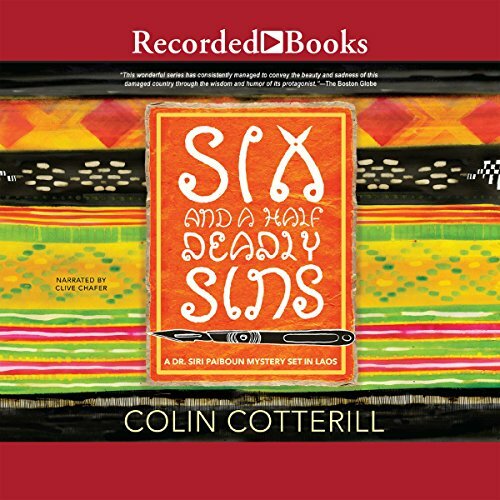 As usual, Colin Cotterill has penned a quirky, wonderfully written and captivating novel. The story is historically accurate, well researched, and is lighthearted but also full of action. The characters are engaging and a little whimsical, and the whole thing is a lot of fun. The question I would like to ask, then, is why the hell you would let this awful narrator mangle the story so badly with his monotonous stoned newsreader narration? After reading all the previous books in the series that are available on audible, I am unfortunately going to have to buy the rest in another format, as this guy is just so terrible that he absolutely ruined any enjoyment I might have has from this novel. One of the worst readings, imho. Clive Chafers' voice sounds robotic, he doesn't give these much-loved characters even a hint of a soul. I sat through the first three chapters before I decided I'd much rather return to the actual book. Colin Cotteril wrote once again a great story of Dr. Siri. Unfortunately read quite poorly. He didn't know, when to make proper pauses, no emphasis. I think a computer would do the same job.